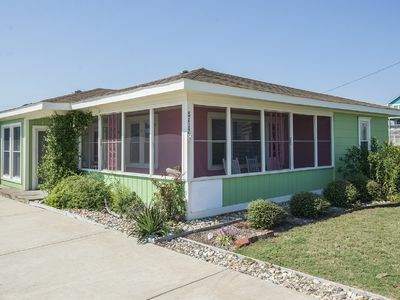 Family Friendly Cottage w/Ocean Views. LifeGuarded Beach at access. Cottage is over 2000 sqft and rents year round. 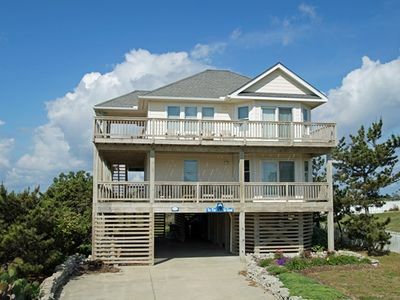 Offers ocean views from front porch and upstairs. Full bathroom on each floor. 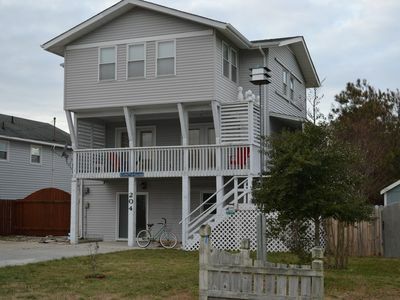 First floor has King BR and game room (foosball, xbox, 46" tv), all other bedrooms on top floor. Top floor also has a sitting/sun room. Upstairs has a Queen bedroom, Double Bunk room sleeps 4, and Pyramid room sleeps 3. Kitchen, dining, and living room open to front deck through double French doors. Plenty of natural light! 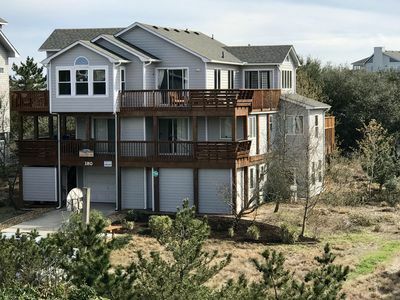 Walk or bike to amenities: grocery stores, ABC store, Ben Franklin, Staples, ocean/outdoor rentals, OBX Sports Club, and too many restaurants to list! Close ride to Nags Head Fishing Pier, Port-O-Call, and Wright Brother's Museum. 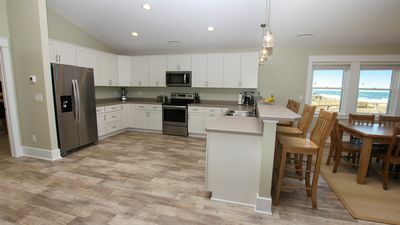 Property also includes, washer/dryer, outdoor shower, basketball hoop, farm-style dining table seats 8 w/3 additional seats at the bar, pack-and-play, table-mounted baby seat, and ample parking. 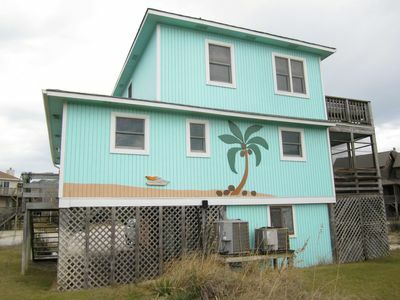 Keyless entry, Central air, free wifi, beach buggy with chairs, outdoor grill, fire pit, and some bikes also included! As a courtesy to our local neighbors and friends, we cater to a family atmosphere. Please, no pets or smoking. Violation is cause for immediate eviction without a refund. Easy walk to beach at Albatross Public Access. Some parking also available. 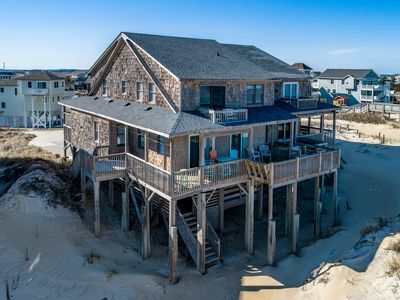 During off season, driving on Nags Head Beach is allowed w/$25 permit from tackle shop or its free on Kill Devil Hills Beach so turn left at access (4WD recommended). 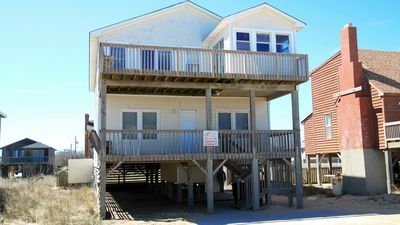 Beach bonfires are also possible in Nags Head with permit. See Town Fire Marshall for details. ***Great house for multiple families. Could sleep three couples and their children. Kids have a bunk room. ***Home has stairs with no elevator. ***For your convenience we use a Keyless entry system. You will receive your entry code via e-mail. ***Linens are not provided but may be rented for a fee from local companies. ***In cases of cancellation, the cancellation must be made in writing. Cancellations greater than 120 days in advance will be refunded in full. 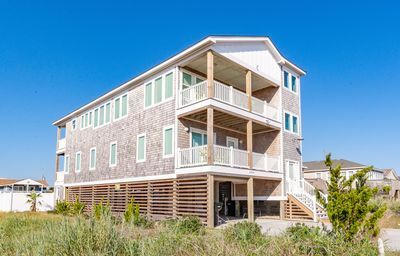 For cancellations less than 120 days, rental amount must be paid in full and owner will advertise the property available for re-rent. No refund of rents will be made until the cancelled period is re-rented and confirmed. If the cancelled period cannot be re-rented, no money will be returned. If the cancelled period is re-rented at the same price, any rent monies paid will be refunded to you, less a $100 service fee, credit card fees, and any insurance fees paid. If the home is rented at a lessor amount , you are responsible for the difference between the original amount and the re-rental amount. Travelers must purchase their own insurance policy for storms, illness cancellations, etc. We do not offer refunds for weather, illness, etc. We do try and re-rent the home at the same price if you cancel. ***This property requires the purchase of CSA Damage Insurance in lieu of a security deposit. Proof of purchase is required no later than final payment. If proof of CSA Insurance is not provided at final payment then rental period is considered cancelled. ***Please note, signer must be at least 25 years of age and remain on premises during the rental period. As a courtesy to our local neighbors and friends, we cater to a family atmosphere. Violation is cause for immediate eviction without a refund. ***Please, NO PETS and NO SMOKING on the premises--no exceptions! Because of allergies and high costs associated with repairs, we are very strict about these requirements. Violation is immediate cause for eviction. 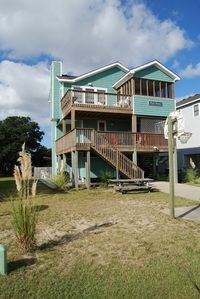 ***Nightly rates are available off-season only; minimum 2 night rental. 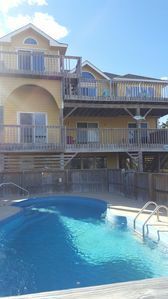 Thanksgiving, Christmas, and New Year's are subject to holiday rate of $150 per night. ***Rental cost is split into 2 payments. 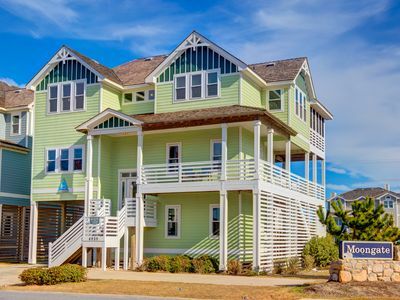 ***This is a Saturday-to-Saturday rental. Check-in no earlier than 1 pm; check-out by 9 am. Game room with foosball, xbox 360, and flat screen tv, plus add'l refrigerator. King bedroom with patio access. Open dining and family room with flat screen tv and blu ray player. 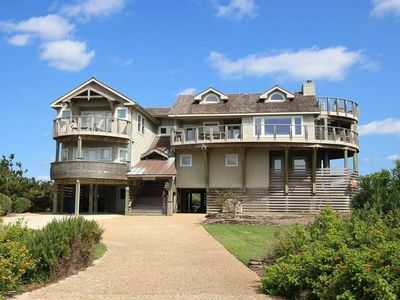 Double French doors access large deck with ocean views. Bathroom with shower, includes washer and dryer. Queen bedroom with ocean view; direct access to sitting/sun room. Double bunk room with direct access to sitting/sun room. Pyramid room has a double bed bunked with a twin bed. Sitting/sun room with ocean views, books, and board games. Full bath with ocean view. WOW! 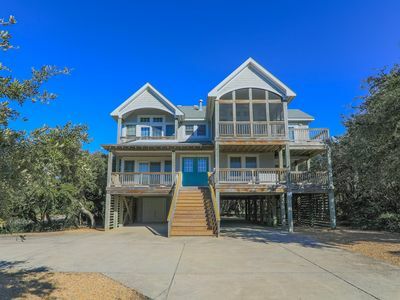 5 BR (2 Masters), Hot Tub, Ocean Views & Comm Pool. A BEAUTY OF A HOME! 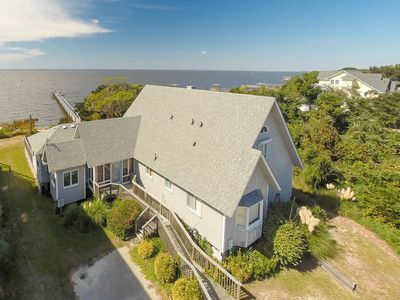 Semi-Oceanfront, Ocean Views, Beach Access, Pool, Tennis, Hot Tub! 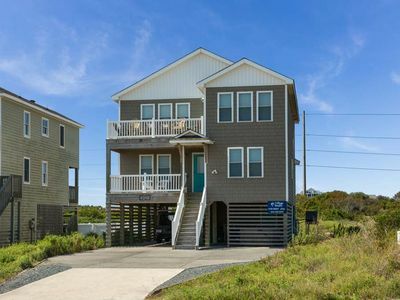 Links End: Soundfront home, golf course community, private hot tub,community pool. 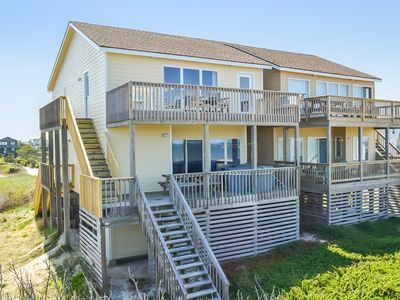 Pelican View: Semi-oceanfront-views of the ocean, private pool and hot tub and an elevator. K0090 The Flying Tiger Inn. 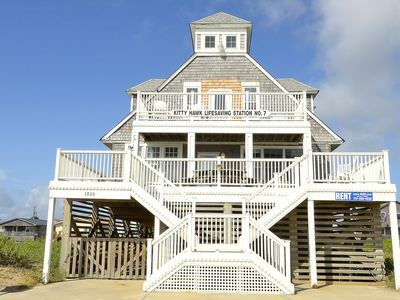 Oceanfront Duplex, Ocean View, Elevator, Hot Tub! K1341 Fantasea. 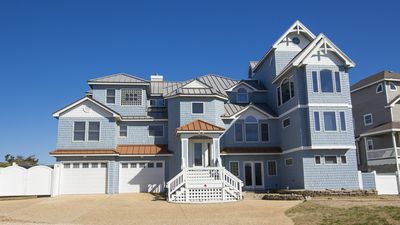 6BR Beautifully Furnished, Pool, Ocean Views, Steps to Beach!